"Sol, who runs and directs the Mothership NYC in Greenpoint, played an active role as one of more seasoned artists in our show by making curatorial recommendations of several other performers, including the shamaness Siw Laurent, whose otherworldly vocals certainly raised the vibration in the space Friday afternoon." “This month’s 2nd Tuesday (which will be held on Tuesday the 21st due to this week’s snowstorm) keynote presenter will be Mothership NYC’s current artist-in-residence, South African visual artist Diane Victor who will give a presentation about her ongoing project: ephemeral portraits drawn with the soot from a candle." 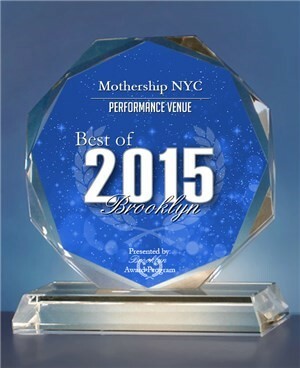 "Mothership NYC has been selected for the 2015 Best of Brooklyn Award in the Performance Venue category by the Brooklyn Award Program. Various sources of information were gathered and analyzed to choose the winners in each category. The 2015 Brooklyn Award Program focuses on quality, not quantity. Winners are determined based on the information gathered both internally by the Brooklyn Award Program and data provided by third parties." “Nils Rune Utsi is the founding member of Slincraze, a rap group from Maze, a village in northern Norway. They rap in Sami, a language spoken by less than 20,000 people. Their goal is to save their language and culture and to fight stereotypes about the people of the region.